Get your tickets for Founders Day! Admission is free! 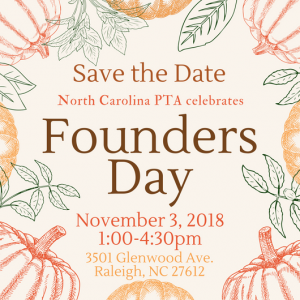 Come celebrate with the NCPTA. We’ve taken our silent auction online this year, with bidding opening on Tuesday, October 30. You can view items and preregister for the auction here. Interested in Interning at NCPTA? NCPTA is looking for an intern! The North Carolina Parent Teacher Association (NCPTA) is the state’s oldest and largest volunteer organization advocating for the education, health, safety and success of all children and youth while building strong families and communities. PTAs across North Carolina impact more than 685,000 children and their families. The Safe Routes to School (SRTS) Advocacy Intern will be responsible for membership engagement, capacity and partner building, developing educational materials, and coordinating and assisting with advocacy trainings to support NCPTA’s Safe Routes to School advocacy objectives. The SRTS Advocacy Intern will work with the Director of Family Engagement and report directly to the Executive Director. This is a part-time, grant-funded, paid internship from date of hire through September 30, 2019. As this is designed as an internship, NCPTA will work with student to obtain credit if desired and eligible and to accommodate class schedule. Those looking to gain valuable advocacy experience with an established nonprofit organization are encouraged to submit a brief cover letter and resume to office@ncpta.org by October 26. Interviews will be conducted on a rolling basis until position is filled. Don’t miss our Lunch and Learns! Back by popular demand! Don’t miss these great opportunities to learn from an expert! What’s up with “common core math”?!? It’s not as complicated as you think! Math teachers today are striving for understanding, not memorizing. “Numerical fluency” is the starting point for building fundamental math skills before middle school. We will talk about this shift in approach and what parents can do to help their children. Want to learn how to help your high school student through the college admissions process? Join Rhonda McRae of A2Z College Planning to learn how to plan, prepare and pay for college. This is a can’t miss opportunity for parents of high schoolers! Join us for “Understanding Your Child’s IEP” — a step-by-step guide through the IEP document to help parents understand the purpose of each section and learn to evaluate their own child’s IEP. Stacey Gahagan is an attorney who represents families through informal advocacy and litigation, when necessary, to ensure students with disabilities receive a FAPE in the least restrictive environment as promised by the IDEA. Ms. Gahagan is committed to teaching parents and helping them to become better advocates for their children. NCPTA Membership Sip and Chats are back! Local Unit & Council Membership VPs/Chairs, and Board of Directors are invited to attend this monthly gathering to receive training, membership support, celebrate each other’s accomplishments, and to hear great things happening in PTA Units across our State. Join us online (preferred) via www.zoom.us (Meeting ID: 535 049 008) or join by phone: 1-646-876-9923 (Meeting ID: 535 049 008). Savings for PTAs from NCPTA and Bloom! NCPTA and Bloom have combined forces to offer $5 one year VIP Savings passes to North Carolina families! Bloom is a Wilmington-based company that offers valuable savings via app to families nationwide. Your $5 purchase helps ensure we have the resources to address current emerging issues that affect the education, health and well-being of our children. With your purchase, NCPTA will continue to be effective in disseminating resources that help further our mission and support our children during these challenging times. To learn more and buy your $5 savings pass, click here! PTAs Unite to Support Hurricane Florence Impacted Areas!